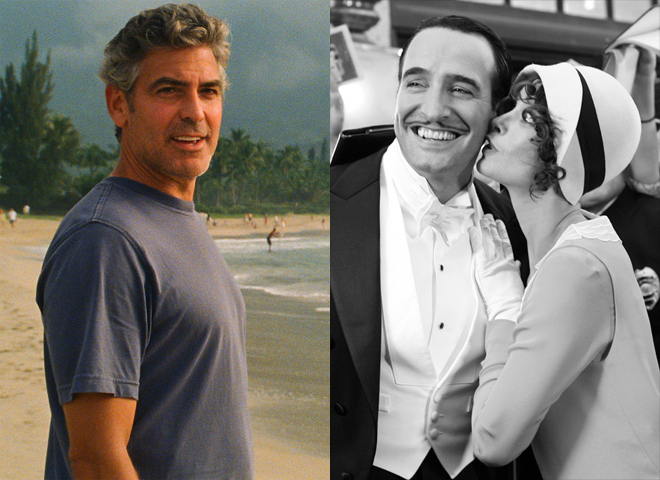 Two film critics' groups on opposite ends of the country voted to honor completely different slates of film achievements as the best of 2011, with the Los Angeles Film Critics Association choosing the George Clooney dramedy "The Descendants" as Best Film, and the Boston Society of Film Critics selecting the valentine to silent cinema, "The Artist." The two groups were split in virtually every category. The Los Angeles critics selected Michael Fassbender as Best Actor, citing his raft of films ("A Dangerous Method," "Jane Eyre," "Shame," and "X-Men: First Class"). Best Supporting Actor went to Christopher Plummer in "Beginners." The L.A. group continued a tradition of recognizing often-unheralded performances by awarding Best Actress to Yun Jung-hee for the South Korean film "Poetry." Best Supporting Actress was Jessica Chastain, who may have won for quantity as well as quality; she was cited for her work in "The Tree of Life," "The Help," "The Debt," "Take Shelter," "Coriolanus" and "Texas Killing Fields." But there seemed to be little in the way of consensus. While "Descendants" took the top prize, Terrence Malick won the Best Director award for "The Tree of Life"; runner-up for that honor was Martin Scorsese ("Hugo"). And while "Tree of Life" was runner-up for Best Film to "Descendants," that film came in second for Best Screenplay to the Iranian film "A Separation" - which itself lost the Best Foreign Language Film Award to the Chinese "City of Life and Death." A hint at dissent among the critics was tweeted by Amy Nicholson of Box Office magazine: "While the morning vote went fast, LAFCA awards now bogged down by fighting. No fisticuffs yet, but I did just yell 'Chaos!'" On the East Coast, the critics favored "The Artist" for Best Picture, but gave Martin Scorsese the Best Director prize for "Hugo." Brad Pitt ("Moneyball") and Albert Brooks ("Drive") won for Best Actor and Supporting Actor (they'd been picked by the New York Film Critics as well), but the BSFC went for Michelle Williams as Best Actress for "My Week With Marilyn." The group favored comedy for Supporting Actress, awarding Melissa McCarthy for "Bridesmaids." The Boston critics managed to go further afield in their balloting. One film that managed runner-up status in Best Picture, Supporting Actress, Ensemble and Screenplay categories was Kenneth Lonergan's "Margaret," a film that sat on a shelf for about six years as the director and distributor quibbled over the 2.5-hour film's editing. This, despite the fact (according to the BSFC proxy tweeting the vote results), that "Many of us couldn't see 'Margaret' because the studio did not issue screeners and there was only one screening." The tweets also revealed which contenders had come in as "close seconds" in the voting. The group even issued a press release "[expressing] its regret that Fox Searchlight refused to distribute screeners of the film 'Margaret' and scheduling only a last-minute screening after numerous requests. The film, which received an extremely limited release, was a favorite of many BSFC members and could have won several awards had it been made available for viewing within a reasonable timeframe. "We encourage Fox Searchlight not to compound this oversight and to make screeners available to the voting body of the Academy of Motion Picture Arts and Sciences and so give the film a fair chance in the upcoming awards competition." The Boston critics even went outside the movie house and into the art gallery to award its Best Editing prize to Christian Marclay's "The Clock," a video installation that runs 24 hours and is comprised of thousands of clips of movies depicting timepieces in real time. There were only two categories in which both critics groups agreed: Best Cinematography (Emmanuel Lubezki for "The Tree of Life") and Best Animated Film ("Rango."). Runner-up: "The Tree of Life"
Best Director: Terrence Malick, "The Tree of Life"
Best Actor: Michael Fassbender for "A Dangerous Method," "Jane Eyre," "Shame" and "X-Men: First Class"
Runner-Up: Michael Shannon, "Take Shelter"
Best Actress: Yun Jung-hee, "Poetry"
Runner-up: Patton Oswalt, "Young Adult"
Best Supporting Actress: Jessica Chastain, "The Tree of Life," "The Help," "The Debt," "Take Shelter," "Coriolanus" and "Texas Killing Fields"
Runner-up: Janet McTeer, "Albert Nobbs"
Runner-up: Alexander Payne, Nat Faxon and Jim Rash, "The Descendants"
Best Cinematography: Emmanuel Lubezki, "The Tree of Life"
Runner-up: Cao Yu, "City of Life and Death"
Best Production Design: Dante Ferretti, "Hugo"
Runner-up: Maria Djurkovic, "Tinker, Tailor, Solider, Spy"
Best Music Score: The Chemical Brothers, "Hanna"
Best Documentary: Werner Herzog, "Cave of Forgotten Dreams"
Runner-up: Clio Barnard, "The Arbor"
New Generation: Antonio Campos, Sean Durkin, Josh Mond and Elizabeth Olsen, the creative team behind "Martha Marcy May Marlene"
Receive Career Achievement Award: Doris Day Doublas Edwards Independent/Experimental Award: Bill Morrison, "Spark of Being," a mash-up of archival footage that retells the legend of Mary Shelley's "Frankenstein." Close second: Michel Hazanavicius, "The Artist"
Best Actor: Best Actor: Brad Pitt, "Moneyball"
Runners-up: George Clooney, "The Descendants," and Michael Fassbender, "Shame"
Best Actress: Michelle Williams, "My Week With Marilyn"
Close runner-up: Meryl Streep, "The Iron Lady"
Best Supporting Actor: Albert Brooks, "Drive"
Best Supporting Actress: Melissa McCarthy, "Bridesmaids"
Close second: Jeannie Berlin, "Margaret"
Best Screenplay: Steven Zaillian, Aaron Sorkin and Stan Chervin, "Moneyball"
Best Use of Music: Tie: "Drive" and "The Artist"
Best Documentary: James Marsh, "Project Nim"
Close second: Richard Press, "Bill Cunningham New York"
Best New Filmmaker (David Brudnoy Award): Sean Durkin, "Martha Marcy May Marlene"
Runner-up: J. C. Chandor, "Margin Call"
Best Editing: Christian Marclay, "The Clock"